You'll be £12.00 closer to your next £10.00 credit when you purchase Very Special Ships. What's this? 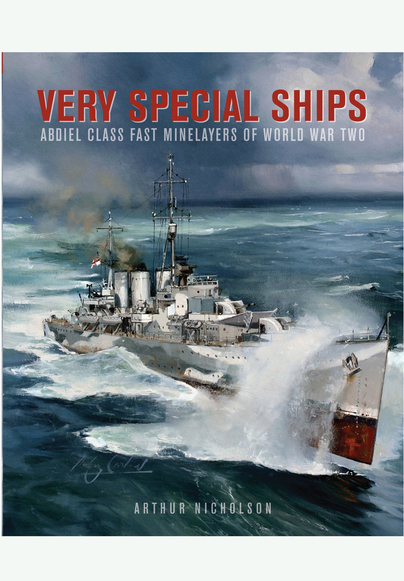 Very Special Ships is the first full-length book about the six Abdiel-class fast minelayers, the fastest and most versatile ships to serve in the Royal Navy in the Second World War. They operated not only as offensive minelayers – dashing into enemy waters under cover of darkness – but in many other roles, most famously as blockade runners to Malta. In lieu of mines, they transported items as diverse as ammunition, condensed milk, gold, and VIPs. Distinguished by their three funnels, the Abdiels were attractive, well-designed ships, and they were also unique – no other navy had such ships, and so they were sought-after commands and blessed with fine captains. To give the fullest picture of this important class of ships, the book details the origins and history of mines, minelayers, and minelaying; covers the origins and design of the class; describes the construction of each of the six ships, and the modified design of the last two; tells in detail of the operational careers of the ships in the second World War, when they played vital roles in the battle of Crete and the siege of Malta, plied the hazardous route to Tobruk, and laid mines off the Italian coast. The post-war careers of the surviving ships is also documented. Written to appeal to naval enthusiasts, students of World War II and modelmakers, the author tells the story of these ships through first-hand accounts, official sources, and specially- commissioned drawings and photographs. ... As it’s always the case for Seaforth Publishing naval books, the iconography is wide, of high quality and includes a great number of unpublished images, many of which are reproduced in large dimensions; There are also well-made maps, whose details and sharpness allow the reader to following at best a text that is as complete and exhaustive as possible, thanks also to the numerous footnotes (grouped at the end of the book) and to a truly complete bibliography with dozens dozens of titles and primary documentary sources on the matter of the !”Abdiel” class. Can be recommended as a well-researched and well-written operational history of a remarkable class of warship. Mine warfare suffers, perhaps, from being one of those features of war that is mentioned only in passing, without a great deal of discussion as to the mechanics of laying minefields, how they were planned and how they were maintained. Mines seem to be perceived as one of those background features of naval war of limited interest, albeit a necessary one to counter. Nicholson's gripping operational history of the six ships of the Abdiel class fills, therefore, an important gap in the knowledge of naval warfare in the first half of the twentieth century. This book covers, in much greater depth than previously published, the operational careers of these six unusual and renowned warships of World War II, three of which were lost in action. Mr Nicholson has gone to considerable effort to locate original sources in the UK, both documentary and from personal recollection, telling the often exciting stories of these hard-tasked ships. If has a large and excellent collection of illustrations, including numerous colour sketches of camouflage schemes. It is carefully and substantially supported by source references and has a good bibliography. I mark this as 4/5 as the subject may be a bit niche, but these ships earned their memorial and personally I found the book well written, excellently presented and very interesting. The book is well illustrated with colour drawings of each ship showing the various camouflage and disguise schemes and a coloured copy of LATONA's 'as-fitted' drawing from the National Maritime Museum archive at the 'Brass Foundry' in Woolwich. There is a good selection of black and white photographs, maps, footnotes, source details for those who want to carry our further research and a comprehensive index. This is an excellent and very readable history of the ABDIEL class minelayers and their unusual careers; I thoroughly recommend it. the reader to the officers and some crew members who sailed on these ships. This adds a human element which lacks in some other naval history books I have read. The author is a story teller as well, which also helps to bring the operational histories alive. I have to admit that while reading the chapter on the Tobruk Run, I missed my Long Island Railroad stop and had to wait for another train back. Also gripping are the accounts describing the efforts to run the supplies to Malta that helped save the island from falling and the sinking of Latona, Abdiel and Welshman. As a modeling reference the book has many photos, some showing excellent details. But the real bonus to modelers is the seven-page full color section in the center of the book which has illustrations showing the camouflage schemes worn by the ships in this class. Also provided is a profile plan of Latona. There is an appendix that covers what plans and models are available and discusses the camouflage schemes worn. My only criticism is the lack of tables in the appendix covering specifications and the key dates and fates of each ship, which would make for a quick reference. The book is well illustrated with colour drawings of each ship showing the various camouflage and disguise schemes and there is a fascinating, coloured copy of Latona’s ‘as-fitted’ drawing from the National Maritime Museum archive at the ‘Brass Foundry’ in Woolwich. The black and white photographs are well chosen and there are maps, footnotes, source details for those who want to carry out further research and a comprehensive index. This is a definitive yet very readable history of the ABDIEL class minelayers and their unusual careers; I thoroughly recommend it. The involvement of these ships in some of the famous events and battles of the war makes for a really fascinating story and has been well put together by the author and Seaforth Publishing. Years ago at an IPMS USA Nationals show I purchased the Waveline HMS Ariadne as it was a unique looking ship and I thought it would build into a splendid model. However, surprisingly I could little reference material to assist me in building the kit. So, for years the kit sat untouched in my stash. Along comes this magnificent book. What a welcomed addition to my library! This 208 page book takes the reader from the origins of Royal Navy mine laying and mine layers to the development of the Abdiel class of fast minelayers to the complete history of each member of the Abdiel class and their exploits throughout World War 2. The book rounds out the discussion by covering the peacetime exploits of the surviving members of the Abdiel class. The jewel of this book, in my opinion, is the 7 page layout in the middle of the book showing color line drawings of various members of the class throughout the war in their respective camouflage livery. The crest for each ship is represented above the drawings - a very nice touch indeed! So, if one is in the least bit interested in the unique class of Royal Navy ship run - do not walk - to your local computer and reserve your copy - you will not be disappointed! A hearty well done to Arthur Nicholson for putting together a very comprehensive book on the Abdiel class of fast mine layers - a much neglected subject! Written to appeal to naval enthusiasts, students of World War II and modelmakers. printed, with lots of drawings and photographs. patterns worn by all of the ships. Highly recommended. ... This book on the minelayer of Abdiel class is well worth reading in relation to the history of the ships. From the class there are also in scale 1/700 kits WSW and Revell and there was a scale of 1/600 Airfix kit of a Manxman and a scale 1/350 of White Ensign Models one of Abdiel. For anyone who wants to build one of these kits, the book is quite helpful, because many photos are included. The plans are certainly very useful both in terms of the construction stages as well as the camouflage schemes. Overall, the book is recommended. ARTHUR NICHOLSON is an American lawyer and naval enthusiast who has been fascinated by fast minelayers since he was a boy. In researching this book he has been assisted by members of the Fast Minelayers Association and the families of men who served on them. This book follows his study of Churchill and the loss of Prince of Wales and Repulse.